The McCarthys Insurance Brokers Senior Football League Division 2 Semi Final; Asdee v Duagh due to have taken place in Brosna on Sunday last; (St. Patricks Day, 12 noon) was called off due to the difficult weather conditions we are experiencing at the minute with all pitches supposidly declaired unplayable. The game will now be refixed by the CCC of the North Kerry Football Board at their next Meeting of the Board with date time and Venue to be confirmed. Knocknagoshel await the winners. Final reminder to anybody who wishes to take up Membership of the Club; don’t forget that Membership of the Club will be closing on Sunday March 31st and which will be strictly adhered to. All you need to do to join is to contact Club Register Kevin Mulvihill as soon as possible before the deadline ends. Adults E20, Senior Citizens and Under age, E10, Family E50. Remember that only fully paid up members before this date will be in line for any match tickets that the Club may aquire and also entitles you to a vote at the Club A.G.M. GOLDEN GOAL Week 6 winners in our Fundraisers”Golden Goal” were; Loraine McElligott, Craughdarrig, Asdee and Maggie Mulvihill, Asdee East who will each receive E40 to be given out each week to the winning number that corresponds with the first goal scored. This is in conjunction with upcoming Fixtures in both National Football and Hurling Leagues and Championship; (Televised games). Tickets are now available and will be on sale each week for the duration of both National League and Championship from Club members and at the usual outlets; “Jack Jays” Bar and John Pius at E2 each. Plans are in progress at the minute for the staging of our Club Fundraiser; “Stars in their Eyes” which is pencilled in to go ahead on the May Bank Holiday weekend. This will be the third edition of the “Stars in their Eyes” and if it is anything to go by like the past two years, it should be another mighty night in the village. The venue will be the Community Centre with the event once again to be hosted by Eoin Kennedy. Certainly the former Kerry Minor footballer must be complimented for the work he has put into the organising of this very important Club venture. At the minute the sponsorship committee are asking anybody from local and surrounding areas if the would be willing to give sponsorship of some kind which would be very much appreciated once again by the Club. Further details will appear in this column of the Kerryman as we move nearer to the deadline. Our Minor team made up from Asdee/Ballylongford/ Ballydonoghue players are going very well in their Division 3 (B) County Minor League with three wins from their three games and are leading the way with Renard two points adrift. Their latest victory was against Kerins O Rahillys on Saturday last at Denis Dowling Park, Coolard, winning on a score of ABB 2-17 Kerins O Rahillys 0-3. SCOR; The best of luck to all those who qualified at the recent North Kerry Finals of Scor Na bPaisti at the Marian Hall, Moyvane and who will now go forward to the County Semi Finals to be held in St. Josephs, Secondary School, Castleisland on this Saturday March 23rd commencing at 4pm. Two from each catagory will qualify on the day to reach the County Finals to go ahead in the Glenbeigh Community Centre on Saturday April 6th with a starting time of 4pm. County Quiz Final will get underway at 2pm at the same venue. FIXTURES. County League Division 5. 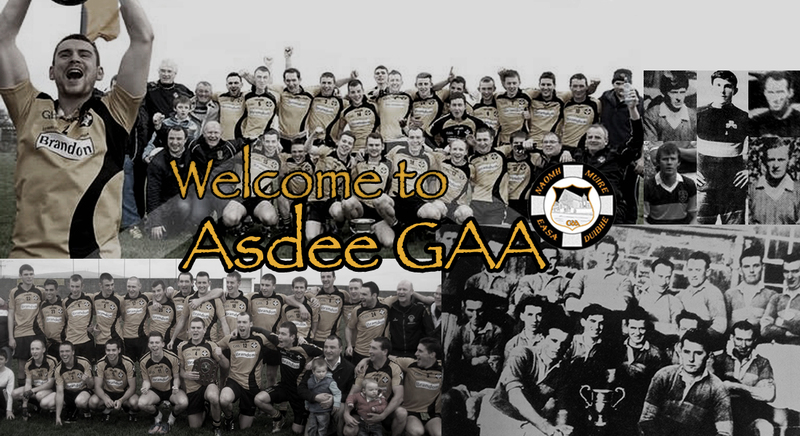 Round 2, Asdee v Moyvane, Sunday March 24th, Con Brosnan, Park, Moyvane. Kerry Petroleum Junior Club Championship Asdee are in Group 2 along with Beale and Reenard and are paired against Moyvane in Round 1 at Con Brosnan Park and is pencilled to start on Sunday March 31st. McCarthys Insurance Brokers Senior Football League Division 2 Semi Final; Asdee v Duagh. Venue and date to be confirmed by the CCC of the North Kerry Football Board.